Tilapia are flaky and mild-tasting. They are lean fish that have lower levels of omega-3 fatty acids than fattier fish species. Because tilapia prefer tropical temperatures, they are raised indoors in Wisconsin. Most are raised in recirculating tanks, and some are used in aquaponic systems. Tilapia are omnivorous fish, so they do not require feed made from wild fish. Some biblical scholars suggest tilapia was the fish used by Jesus to feed the crowds at the Sea of Galilee. 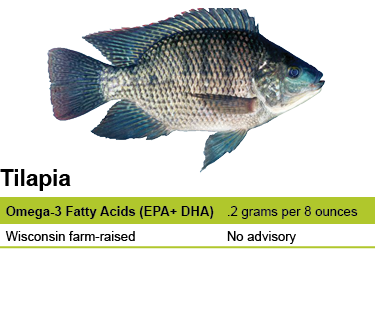 There is no consumption advisory for Wisconsin farm-raised tilapia. There are several species of tilapia, and they are native to the Middle East and Africa. They are hardy fish that grow quickly and are very tolerant of changes in water quality. Tilapia are likely the oldest farm-raised fish in the world. Today, more than 80 nations, including the United States, produce farm-raised tilapia. China supplies most of the imported tilapia in the United States, followed by Indonesia, Ecuador and Honduras. The farmers in these countries usually raise tilapia in outdoor ponds or floating cages.